QR is the recirculating valve based on the TiAL high performance Q. Outline interchangeable with the Q and original BV50. It's Offered with a variety of springs for difference vacuum levels, and a special spring for supercharged vehicles. Customizable outlet ports offer flexibility to integrate into custom & existing applications. TiAL Designed V-Band Clamps are manufactured in house. CNC machined aluminum clamps ensure a secure and pressure tight fit. QR is a recirculating valve based on the high performance TiAL Q. Optional 25.4mm (1.00"), 29mm (1.14") GTR, 34mm Subaru/evo/dsm or 38.1mm 1.50" recirculation port. Uses the standard TiAL V-band flange and can be converted into a standard Q BOV by swapping the bottom piece. For use on turbo-charged and super-charged applications (Paxton, Vortec, etc.). The body and all internal components are CNC-machined from 6061 aluminum alloy. It features a large 1.98 in (50.5mm) valve. The V-Band design aluminum mounting clamp gives a very clean and unique appearance. The clamp uses Stainless Steel hardware for a long lasting, corrosion-free appearance. The valve seal utilizes a Viton O-ring that is clamped in place to prevent the possibility of sticking to the seat and pulling out. The valve stem and guide are Teflon-lubricated, hard anodize-coated for wear resistance. The Blow Off Valve also comes with our own machined aluminum banjo-type air fitting and bolt, with over sized 10mm hose barb for quick actuator response. The actuator has a high temp silicone Nomex-reinforced diaphragm for long life. An aluminum or mild steel weld base mounting flange is furnished with each unit. Stainless Steel is available at an additional cost. 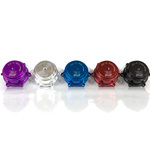 The use of 6061 aluminum allows the housing to be anodized with a selection of colors. Color anodized aluminum options (Silver, Red, Blue, Purple, Black). Copyright Full Throttle Parts and Performance. All Rights Reserved. powered by 3DCart e-Commerce Software.